Gimmick: Bowie Gray is a broken man. His entire life has been one train wreck after another; which has all lead him to who he is today. A man who is constantly at war with the voices (His consciousness) inside his head. You have the ‘Soul’ which tries to steer Bowie down the path of good, and you have his counter, the ‘Reaper’ who well, is everything bad and then you have Bowie himself, who is lost and confused. However, for wrestling, well wrestling to him is a mechanism, it’s a way for him to cope. A place where he can unleash the rage bottled up inside him and a place where his mind becomes one, the constant bickering of voices stops and the ‘Reaper’ takes control. What are your character’s motivations for competing? Punishment. To inflict as much pain as he can on those that step inside the ring with him, and on himself. Tendency to Cheat: Rarely. Winning isn’t everything to Bowie Gray. Least Favorite Match Types: Four-way match. Favorite Weapon: Barbwire baseball bat. In-Ring Achievements: THZ Lightweight Champion 1x. THZ Gruesome Champion 1x. THZ Shockwave Winner. 1. 'Lost Sight' Apron Tope Suicida. 2. '10 Feet Down' Open hart surgery. 1. 'Moment of Silence' Submission move. The Regal Stretch. 2. 'Paralyzed' Power move. It’s sort of a backbreaker variation. It starts as a sunset flip, Bowie keeps his knees at the opponent's back and makes the flip. Strengths: Drive. Bowie Gray has an incredible endurance/stamina. He isn’t one to go down easy, no matter how much you’ve taken him to hell and back. Weakness: Powerful opponents. Bowie Gray isn’t the biggest of guys as you can see. Keep the fight at a distance, and he’ll fend well for himself. Get in too close, and he’s in for a night of trouble against those remarkable bigger than he. Bowie Gray  was born July 4th, 1995 in Salem, Massachusetts to Damon and Alana Gray. In total there was five Gray children, four boys, and one girl. Bowie was the youngest of them all, and according to his siblings, was the runt of the pack. The smallest Gray by a long shot. Life has never been perfect for Bowie Gray, as growing up he consistently dealt with being picked on and bullied by his older siblings and kids around the neighborhood. Which didn’t help either that he was neglected by both his parents, as his father was an alcoholic and his mother was a pill-popping junkie and spent most of his life dealing with both emotional and physical abuse from both his parents. Growing up; Friends, well Bowie never had any real friends. Well besides Maisie Wall. This girl; she was his only friend, the person that made him feel safe. Feel wanted. The only thing in this world that Bowie Gray truly loved. From kindergarten up until grade eleven the two; they were inseparable. Always together. Until Maisie Wall had changed and had found popularity among the “cool kids.” Popularity; that forced her to sever all ties with Bowie, and even act as Bowie didn’t even exist. I guess you could say this was the breaking point in Bowie Gray’s life. From the moment he was born, Bowie wasn’t well; he wasn’t all there in the head you know. His parents never paid any attention to him to notice, to seek help for Bowie so over the years, Bowie had just gotten worse and worse and then when this all happened; it was the final straw in Bowie’s life and a time when the voices in his head, had really come to life. The ‘Reaper’ had come to life. After being expelled from school for a particular incident, Bowie gathered a few of his belongings; a backpack worth and ran, ran as far away from Salem as he could. It wasn’t until a few years later; living on the streets of NYC that Bowie Gray had met a promoter, a man – a wicked boy – that; well could see Bowie Gray wasn’t well but used Bowie to fill his own pocket, and that is how Bowie found wrestling. This man took Bowie’s sickness and turned it into entertainment and gave Bowie a place to let the Reaper out without any worry of consequences. Gave Bowie a place to unleash the rage inside him. Bowie Gray moved up the ranks of THZ quick, actually turned into a household favorite during his nine-month stint with the Indy promotion but that all came to a rather quick end. When another incident involving Bowie had taken place. An episode that had seen his contract terminated with the THZ and the doors closed on him from ever returning to the promotion that he started out with. 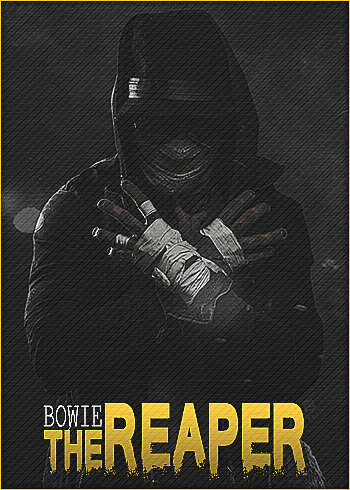 After nearly a year absence from the ring, Bowie Gray had found the Battleground. A development league for the EAW. Where he is currently located today. Thanks to Sunami Tayo for the sig! You're going to be booked v @Conor Gladstone for a match, the deadline for the promos is 11:59 est on Sunday. Welcome to EAW! Love the sign up and hope you have fun! Feel free to ask any questions you may have! ZOMG DARBY ALLIN!!!! WELCOME AND HAVE FUN!!!! Thanks! Now here is hoping I can do this character justice. It's a brand new character I'm trying, so you can probably expect a lot of trial and error with Bowie as I try to bring him to life, lol. Glad to be here, because this place looks both awesome and fun. Had to make a little change on Bowie's application. Changed his alignment from ruthless heel to tweener. Even before I knew, I knew. This is so ridiculously you.